In 1972, Eric Dinerstein was in film school at Northwestern University, with few thoughts of nature, let alone tiger-filled jungles at the base of the Himalayas or the antelope-studded Serengeti plain. Yet thanks to some inspiring teachers and the squawk of a little green heron that awakened him to nature's fundamental wonders, Dinerstein would ultimately become a leading conservation biologist, traveling to these and other remote corners of the world to protect creatures ranging from the striking snow leopard to the homely wrinkle-faced bat. Dinerstein's mission, a cast of free-spirited characters uncommonly committed to-and remarkably successful at-preserving slices of the world's natural heritage. A simple sense of responsibility, one feels, shines through all of Dinerstein's experiences: not just to marvel at what we see, but to join in efforts sustain the planet's exquisite design. Tigerland's message is clear: individuals make all the difference; if we combine science, advocacy, and passion, ambitious visions for conservation can become reality-even against overwhelming odds. "Dinerstein's compelling tour of wild places and his vivid portraits of intrepid wildlife defenders offer convincing arguments for providing the treasures of nature with the same reverence and protection we accord cherished works of art." "More than almost anyone else alive, Eric Dinerstein has gone where the wild things are. Part travelogue, part autobiography, Tigerland is filled with stories of exploration and adventure, told with wisdom, wit, and affection." David S. Wilcove, Princeton University, author of "The Condor's Shadow"
"This delightfully readable memoir illustrates why the best field biology is also adventure, and why the search for adventure is the best way to conduct field biology." "...thoroughly enjoyable book that combines a memoir of his many field trips to exotic locales with a powerful call for the preservation of species and restoration of natural habitats. His delightful writing style is scientifically accurate but completely accessible to readers who are not well versed in the arcane details of evolutionary biology and ecological theory...recommended." "Dinerstein brings his work to life in vivid, inspirational detail." 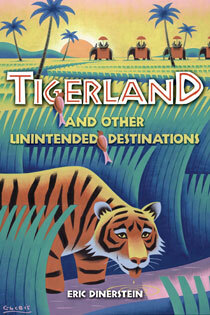 Tigerland and Other Unintended Destinations won the American Association for the Advancement of Science's award for Science writing, the AAAS/Subaru SB&F Prize for Excellence in Science Books, in 2007.